Probably the strangest book series I’ve ever read. So, now it begins. The first week of my Young Adult month. A whole month is not bad for a girl who wasn’t even sure what Young Adult fiction was a few years ago. But as I stuck my toes into the increasingly deep pool of this genre I ended up discovering some of the most interesting books I’ve ever read. 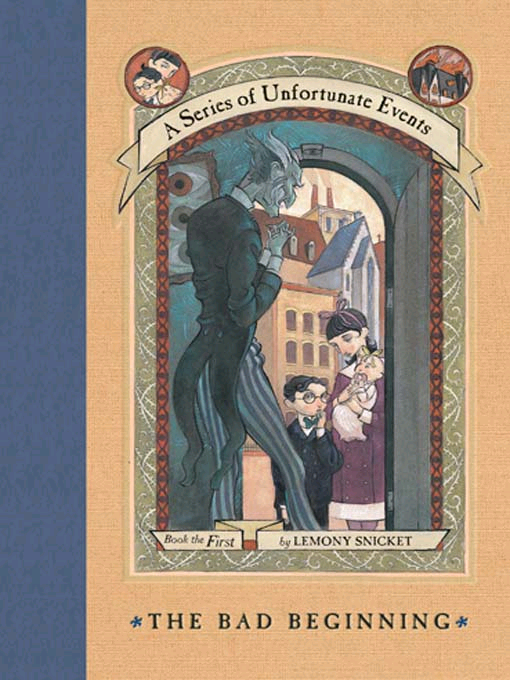 And it seems to fitting to begin with the infamous A Series of Unfortunate Events. Oh, how can one describe this strange 13 book series? Hm, perhaps I can put it into the same type of terms the author himself might use. Reading A Series of Unfortunate Events is like ordering a cup of tea and getting a cup of mocha cappuccino served to you instead. First you are shocked to taste the bitter coffee base. Next you are delighted to savor the sweet, chocolately flavor of the mocha. And then you are disturbed but the extra calories you suddenly find yourself consuming. Shocked, delighted, disturbed…and then disturbed, shocked and delighted…and so on. I think those are the best words to describe what I went through as I read each book. I have an interesting task of ahead of me, because I have to tell you why I liked this series, why parents might want to be hesitant, and then why I think this series should be read. But first, let’s start with the story. Violet (14), Klaus (12), and Sunny (infant) Baudelaire have a lovely life. They have loving parents, considerable wealth and, according to the author, are both very talented and extremely attractive children. But their circumstance take a turn for the worse on the day a terrible fire consumes both their parents and their mansion and their money is put into trust, unable to be used until Violet turns 21. Such begins the tragic journey of the Baudelaire children as they travel from location to location, handed off to one “guardian” after another, meeting along the way truly murderous villains, the noblest of heroes, and plenty of people along the way who have yet to choose who they are. The first thing that made me love this series was the writing style. The author, a Mr. Lemony Snicket, who is as much a character in the book as the Baudelaires, has a truly funny way of writing. His anecdotes, style of description and frequent inserts of his own tragic life left me smiling, occasionally outright laughing. The humor is balanced throughout the book well, helping to keep you from outright despairing alongside the young heroes and heroines. There is a lot of death in this series. More than I expected, even though I knew a little about the series from the movie. The deaths are never graphically described, but are often gruesome in nature. And some imagery might be considered scary, even if the ideas are never actually acted upon. Also, smoking, drunkenness, adultery and dressing immodestly are touched upon. All of these behaviors are clearly portrayed as bad and, again, are not graphic or overdone. It is just up to parents to decide at what age they want their children reading about these subjects. Now, in the wake of that devastating paragraph, let me tell you why I think these books should be read. Adults included. The books, in all the wild ups and downs of the decidedly strange plot, are riddled with deep moments of self-reflections and life’s tougher questions. The subject of dealing with the loss of loved ones is woven throughout, from different perspectives both young and old. Wrong and right are set as clear choices that everyone has to makes, even in situations where most would justify their actions. Why people make the wrong choice is asked repeatedly, and the subject of what happens when we think it’s okay to do something wrong for the sake of the right is often visited. Even in it’s equally strange ending, the two primary principles you are left with are nothing short of poignant. Sometimes I gripped the edges of this book in suspense, sometimes I laughed out loud, sometimes I experience the sadness and defeat alongside the characters, sometimes I wanted to shake the book in frustration and in the end, after I read the last line of the last page, I sat for a while and thought about it. As far as I’m concerned, any book that inspires that much emotion is worth reading. Have you ever stumbled upon a book that broke the standard rules of predictability? Next > Live, Love…and then stir in a little super hero.